Simpson Thomas and Associates, personal injury Law Firm, senior lawyer Bernie Simpson C.M. was highly critical of the BC Provincial Government’s January 9th audit, which was released last week to a government website in response to Simpson Thomas requests under the Freedom of Information Act. Simpson Thomas filed, on behalf of two of the seriously injured passengers June Won Kim and Hee Eun Kim, a Notice of Civil Claim in the Supreme Court of British Columbia several days after the motor vehicle accident of December 30, 2012. Extensive injuries were suffered by the passengers including brain injury, fractured neck, fractured back, and internal injuries. Nine people died in the accident and 39 seriously injured. The Simpson Thomas Notice of Civil Claim alleged against the defendant bus driver Haeng-Kyu Hwang that he was driving at an excessive rate of speed considering the prevailing road conditions, driving a defective motor vehicle, driving a vehicle where he knew or should have known that the tires were defective, driving while severely impaired by fatigue and lack of sleep, and driving without due care and attention. Particulars of negligence were also alleged against the company Mi Joo Tour and Travel Ltd., and its alleged that the company knew that the vehicle was mechanically defective, the tires were inadequate for the road conditions, and knowing that the defendant driver Hwang should have not been driving the bus as they knew or ought to have known that his ability to do so was impaired by fatigue and lack of sleep. In the statement released by the Firm of Simpson Thomas, a well-known personal injury firm in Vancouver, British Columbia, stated: An extensive audit took place by the Transportation Ministry on the BC Provincial Government after the accident. This audit was released as a result of Simpson Thomas request, under the Freedom of Information Act. The report stated the following: That the company did not keep records tracking it’s drivers time behind the wheel in the previous year, and the company does not monitor the hours of service. The company did not provide any supporting documents at the time of the audit. In all areas where the audit examined the company, they were severely deficient in the areas of driving experience, vehicle maintenance, hours of service, and safety practices. In nearly every category the company received a “non-compliance” rate of 100%. In addition, the company did not properly oversee it’s drivers work hours to ensure that they were within the regulations. Other problems included pre-trip inspection reports were not completed, vehicle defects were not noted on the trip inspection reports, trip inspection reports were not kept for a minimum of three months, vehicle maintenance reports were not retained for three years, and the company did not have an adequate safety plan or a vehicle maintenance plan. “The audit, which occurred shortly after the tragedy on December 30th, 2012, ordered the company to make 31 changes”. Simpson Thomas further stated: “It would appear that the history of this company was well-known to the Department of Transport”. CNN reported shortly after the accident that it obtained additional documents that showed that the travel agency Mi Joo Tours and Travel Ltd. had been “cited for 11 violations in 2010, and 8 violations in 2011”. Among those violations were failures to implement drug-and alcohol-testing programs, investigate drivers’ backgrounds, and perform safety inspections. Bernie Simpson from Simpson Thomas stated that: “that safety audit conducted a week and a half after this tragedy prompted the province to revoke the company’s license. One must ask what took so long for the BC Government to act when they knew that the company was not compliant with the requirements. Although there is no direct connection between the BC Government’s failure to act until after the accident and the tragedy that occurred, if the Government was more vigilant and had suspended the license before December 30th, 2012 this tragedy would have not occurred. The Government has a lot to account for with regards to this tragedy, and one has to wonder how many more vehicles are out there who’s license should be cancelled”. 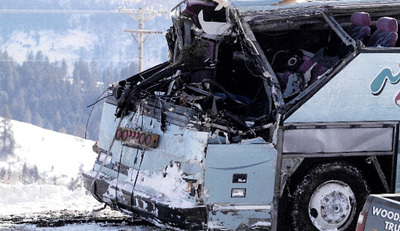 It was noted that the bus was filled with Korean citizens from Korea and from British Columbia, Washington State, and Oregon, and the tragedy traumatized the South Korean community in British Columbia who assumed that the vehicle was safe and that the driver was qualified. It was noted that one day before the accident some visitors were so concerned that they refused to travel on the bus any further. The public and in particular the South Korean community deserves to know why the Government continued to let this vehicle drive on the roads, which resulted in this terrible tragedy, stated Simpson. Bernie Simpson C.M., a former member of the legislature for Vancouver-Fraserview and a recipient of the Order of Canada, is insisting on behalf of June Won Kim and Hee Eun Kim and the others whose lives have been shattered as a result of this accident, that the Government give an explanation as to how much more they knew about the company’s non-compliance and why they did not act sooner to avoid this tragedy.